The company was founded in 2002 by a lady named Lucy Postins. This lady and co-founder (video below) was a proud owner of a Rhodesian Ridgeback, a dog who suffered from frequent skin issues as well as painful ear infections. Lucy had a firm belief that a healthier diet would benefit her pooch and possibly eliminate theses skin and ear issues once and for all. Lucy was not convinced that the dog food market offered her anything that would meet her needs so she decided to make her own. She made this food in her own kitchen and started her pet on the recipes she made from home. Lucy quickly discovered that her pooch was showing remarkable results with this new source of food, and realized other dog owners could do so as well. As a result, the Honest Kitchen became a reality in 2002. So what does the Honest Kitchen have to offer? To answer this question, you really need to start from the beginning when Lucy was making her recipes right from her own kitchen. Over the years, the company would offer a variety of recipes, all based on what pet owners were asking for. To better illustrate this, let’s break down these recipes throughout the years of the company’s existence. 2018-2019 – Produced a dry food, with the safety and health benefits of 100% Human Grade. No prep work required! Many of the recipes offered by Honest Kitchen are of the dehydrated variety. So what is dehydrated dog food? It’s a dry dog food, that is basically processed differently than the dry kibble you find in most dog foods. Honest Kitchen dehydrated dog food is processed in a manner that allows for the nutrients to be preserved and maintain its nutritional value. Removing as much moisture as possible is key to the dehydration process. By using this process, it is possible to lock in and maintain the nutrients within the ingredients. In addition, this process helps to preserve the food, giving it a much longer shelf life. The video below will give you a better understanding. Basically, the term human grade dog food is exactly what it appears to be. Dog food, in its finished product, is actually suitable and legal for human consumption as well. Now, I am not suggesting that you open a bag of Honest Kitchen dog food, pull out your fork from the kitchen drawer and enjoy the taste as your pooch would. The ingredients contained in the finished product are nutritious and edible for humans to consume, but keep in mind that this still dog food. Regulations put on human foods by the FDA and USDA are much more stringent than those regarding pet food. The FDA has approved the Honest Kitchen as a human grade feed. 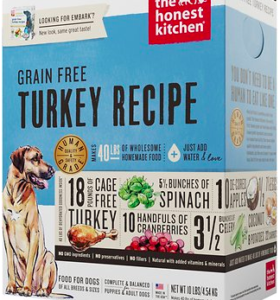 Which Ingredients Are Used In Honest Kitchen Dog Food? 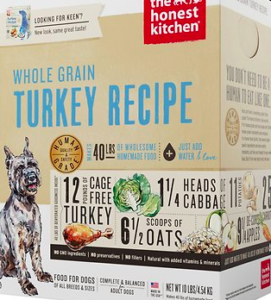 Before I get into the specific ingredients used in the Honest Kitchen recipes, it is important to point out the company’s belief when it comes to other pet food brands. 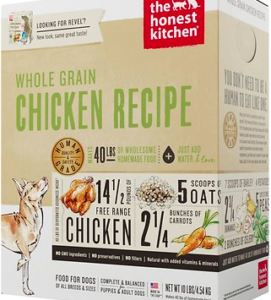 The Honest Kitchen Company is not convinced that these other dog food brands are producing a natural and healthy recipe for pets. They firmly feel that a human grade diet is the only way to ensure a safe, healthy and quality diet and produce their formulas based on this belief. 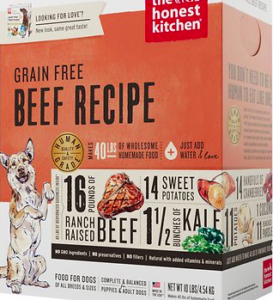 Furthermore, the company believes that ingredients omitted from recipes is just as important as what actually is contained within a dog food recipe. Here is a list of those ingredients that are excluded from the company’s recipes. As you can see, Honest Kitchen strongly believes that these 6 ingredients area big ‘Thumbs Down’ that provide little to no benefits to our pets, and omit these from their recipes. In my opinion, many dog owners throughout the world express the same sentiments regarding these ingredients. What Does Honest Kitchen Offer To Dog Owners? The company offers a number of pet food options to their customers with a number of meals. As mentioned earlier, Honest Kitchen actually listens to the needs of dog owners, and produces recipes to meet these needs. Let’s break down these products below in detail to give you a better understanding of what this company offers. You can click on any of the product images for more details. Made with real free-range chicken with fruits and vegetables. Grain-free recipe without wheat, soy, corn or added sugars. Great for pooches with food sensitivities. The dehydration of whole foods secures the vitamins and minerals to ensure a quality nutrition. Contains no byproducts, preservatives, GMO ingredients, hormones or antibiotics. 100% human grade ingredients. Just add water to the formula and you are ready to go. Suitable for small, medium and large breeds. Available in 2 pound, 4 pound and 10 pound box. Made with free-range chicken, garden produce and organic whole grain barley. AAFCO diet contains higher calories and proteins, great source for puppies, pregnant dogs and active adult dogs. Made with minimally processed, dehydrated, whole-food ingredients in the USA. Made without by-products, preservatives or GMO ingredients. Easy preparation, simply mix food with warm water, stir and serve. Contains an antioxidant-rich selection of fruits and veggies. No prep work needed. 100% human-grade dog food base, just add your choice of meat and water. Whole-food ingredients in the USA with minimal processing. Contains no by-products, GMO ingredients, or preservatives. Available in 3 pound, 7 pound, and 1.75 ounce cup, case of 12. Recipe contains cage-free turkey, organic whole oats and garden produce. No by-products, preservatives or GMO ingredients. Good choice for adult-dog maintenance and senior dogs. Available in 2 pound, 4 pound, 10 pound box and 1.75 ounce cup, case of 12. Wholesome meal for puppies and adult dogs. 100% real ranch raised beef with a healthy source of fruits and vegetables. No byproducts, preservatives, GMO ingredients, hormones or antibiotics. Made with real free-range turkey, fruits and vegetables. Grain-free formula. No corn, wheat, or soy. Made in the USA with 100% human grade ingredients. Great for dogs with food sensitivities. Intended for puppies and adult dogs of all breeds and sizes. Grain-free, gluten-free recipe made with wild-caught, Marine Stewardship Council-certified white fish. Another great choice dogs with food sensitivities. Available in 4 and 10 pound box. The Honest Kitchen Proper Toppers| What Are They? Honest Kitchen also produces recipes that are known as toppers. So, what exactly is a topper? Like their meals, the toppers are dehydrated and only include 5 whole food ingredients. Each recipe contains 90% real meat with fruits and vegetables. These toppers can be used as treat, placed on top of your pet’s main meal, or as a whole meal. These toppers are less expensive than the meals mentioned earlier. Their ‘cluster’ forms make it ideal for our four-legged companions to consume which also provides added vitamins and minerals. Simply click on each item below to check out these toppers for yourself. Honest Kitchen Recipes|What Are Customers Saying? If you were to take a look at what customers are saying regarding the Honest Kitchen recipes, I think you would be impressed. Dog owners who have used this product have given various reviews which are detailed below. Let’s take a look at a few of these now and start with reviews from Chewy customers who are providing feedback on the Dehydrated Grain-Free Chicken Recipe. As you can see, 92% of dog owners would recommend this product with 82% giving this product a 5 star rating. And finally, take a look at what PetFlow customers have to say about the Dehydrated Grain-Free Chicken Recipe. 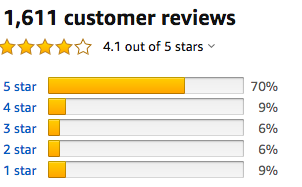 Based on the three customer review listed above, it seems evident to me that the majority of dog owners who have used this recipe are clearly satisfied with this product. Honest Kitchen| What Else Does The Company Offer? Dehydrated Beams Ocean Wolfish Skins – These chew sticks, made from wild-caught fish skins, and ideal for dental health. Provides a solid source of protein a well. Joyful Jerky Beef Filets – Made with all-natural beef, and appropriate for dogs with food sensitivities. Made with 100% human-grade ingredients and suitable for medium or large sized dogs. Peck’s Grain-Free Beef & Blueberry Cookie Treats – Made from ranch-raised beef and vitamin-rich blueberries, bite-sized and great for training your pet. Just 8 calories per cookie. Grain-Free Fish & Pumpkin Cookie Treats – Made from wild-caught fish and fiber-rich pumpkin, 8 calories per treat and also great for training your pooch. Joyful Jerky Chicken Filets – Another great-tasting filet made with with all-natural, cage-free, and antibiotic-free chicken. Made with real, whole food ingredients. Grain-Free Chicken & Cranberry Cookie Treats – Made with free-range chicken and cranberries and full of antioxidants. Bite-sized and great for training. Nuzzles Grain-Free Duck & Cherry Cookie Treats – Made from cage-free duck and cherries, ideal for training or just showing some love. Only 8 calories per treat with a delicious taste. I certainly hope this article will give you a better understanding regarding the Honest Kitchen Company, its products, and other pertinent information. The company believes that dehydrated dog food will provide your pet with the best nutrition, and seems to have impressed dog owners with these products. Very few dog food companies can make the claim that their recipes are in fact Human Grade, and contain ingredients that are suitable for human consumption. Furthermore, the company has eliminated those ingredients from their recipes including fillers, by-products, corn, soy, wheat, etc. The real test comes with the dog owners who actually purchased and fed these recipes to their dogs. In the article, I listed 3 different sites with reviews where the Honest Kitchen recipes have been purchased. All three of these sites indicate that the product was indeed seen as one that would be highly recommended to other dog owners. I am obviously a dog owner myself, and one that feels that a pet is part of the family. Keeping my dogs happy and healthy has always been of great importance to me, and I have done extensive research on the benefits of a natural, healthy dog food. A disclaimer here: I have not purchased or used the Honest Kitchen recipes myself. With that said, and after researching this product, I fully intend to purchase one of these recipes in the near future. As the owner of an Afghan Hound myself, this is a type of meal that I am sure she would enjoy. I feel confident in knowing that she will be receiving a nutritious, healthy diet with human grade ingredients. I will definitely be back to let you know my opinion on the Honest Kitchen recipe that I choose, and I would ask that you leave a comment below as well. Have you tried one of these recipes? Have you seen any changes in your pet? Would you recommend this product to other dog owners? What has been your experience? Feel free to comment below, and thank you for taking the time to view this article. I sincerely hope that it has been helpful! ← True Acre Dog Food|Good Or Bad? 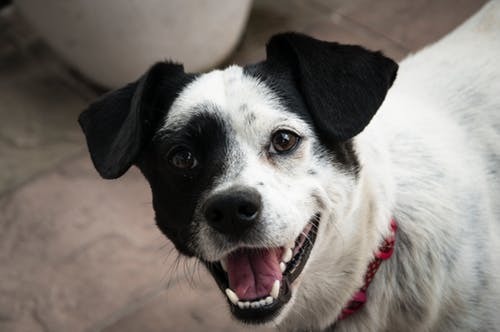 I like that Honest Kitchen Dog Food is made of 100% human grade ingredients, because I feed my for alot with left overs of the food I eat, so I like that when she’s eating the Honest Kitchen Dog Food, she won’t be missing out on the treats I have been sharing with her. I also like that the food is dehydrated, that way, it lasts much longer and saves me from waste. Thank you for stopping by and leaving a comment. 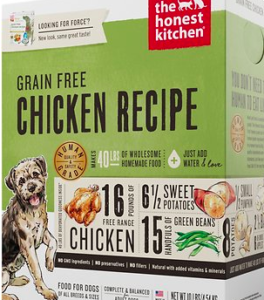 Yes, the fact that the Honest Kitchen Dog Food is 100% human grade makes this brand quite appealing. It is also convenient that our pets will be actually consuming a healthy, wholesome treat without all of the unwanted ingredients. I sincerely hope the article has brought you some further insight regarding this product. Dog food has always been important to me. I love my fur babies and always want them to stay as healthy as possible. This has been a good review on this product as I have not heard of this company. I will definitely have to look more into them and see about trying one of their recipes with my own babies. 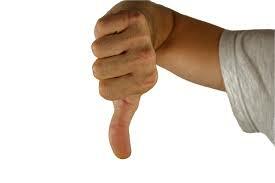 I would be interested to see why the negative reviews on Amazon and Chewy before trying. I totally agree with diet change helping to improve skin irritations, it certainly works with humans why wouldn’t we extend this to our pets. All of these products sound great and healthy for our four legged family members and I believe they deserve to be treated no less than we are. My question for you though is do they also make cat food or other pet foods? Thanks for visiting and I totally agree with your feelings on diet and how it does make a difference in both the health of humans and pets. This in one of the major reasons I chose The Human Kitchen recipes to research, as I was intrigued with the whole ‘Human Grade’ concept. Looks to be a quality food for sure. And yes, the company does supply a variety of cat meals, treats as well. Once again am speechless base on the knowledge i gain as a member of wealthy affiliate, until now i never knew the meaning of hydrated fog food but this review has thought me how to make my own dog food and my little puppy will look healthier and happier and thanks to the author and honest kitchen for the tips on how to make my dog food. So happy you stopped by! Without question, a hydrated diet for your pup will certainly pay dividends as you can be sure he/she is getting a quality, healthy source of food. The Honest Kitchen Company bases this belief on every recipe they make. Healthy Kitchen will provide these nutritious ingredients for you, just open the box, add some water and stir for 3 minutes. Your pup is now ready for a delicious meal! This article introduces me to something new that I have never heard, ‘dehydrated dog food’. I have three pups. They are my babies. To be honest with you, I have not seen the Honest Kitchen Dog Food brand either. Your article convinced me to at least give this brand a try. I purchase my dog food from Chewy. I’ve already bookmarked this article and will definitely order a sample to give to my pups. Thanks for the information. TQ, so glad you stopped by! I can tell you have a great love for your pups, which is always so good to hear. As you may have noticed in my article, I too am somewhat unfamiliar with the concept of dehydrated dog food which piked my interest. This is the main reason I decided to research this type of dog food and The Honest Kitchen company. I plan trying one of these recipes with my own dog as well and I will be glad to share my results with you. Please do the same, I would love to see what you and your pups think. I have seen and read through so many books on animals and their nutrition and when it comes to feeding dogs it’s more costly and cost effective to buy their feed from local stores rather than stress oneself through preparing a meal or feed for them. Though, your opinion was quite wonderful and nice but i just feel its cool that way. No problem, I wish you and your pets the best! Thanks Tracy, I appreciate your response. I truly hope this article will bring some value to dog owners everywhere, and that they consider this type of meal for their pet. Hopefully, the day of just grabbing a bag of food from the shelf are over, and dog owners realize the importance of ingredients their dogs are consuming. This brand, The Honest Kitchen, is one of the best. Thanks again for stopping by, and thank you for your feedback. I absolutely love what I read in this insightful article because it is full of great information. This is fascinating and interesting to me. I really gained some point in reading this article about honest kitchen dog food. Every dog owner should read this post, I’m a dog lover and dig is my best friend. I would love to order this dehydrated grain free beef recipe for my dog. Thanks friend, so happy you enjoyed the article! Glad to hear your dog is your best friend. I feel the same way about mine! Please let if you purchase one of the Honest Kitchen recipes and what type of results you see. 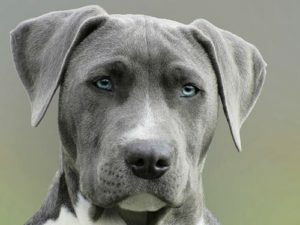 This article is really informative and helpful in knowing the right dog food. Dogs are amazing animals that should be cared for and given the best kitchen food. I really like all the types of packaged food for dogs. I will be ordering for the Dehydrated Grain-Free Turkey Recipe and Dehydrated Grain-Free Beef Recipe. My dog is gonna enjoy them. Nice article. Thanks Brent, looks like your dog is going to receive quite the treat! Please let me know how your dog responds to the recipes. I look forward to your feedback. 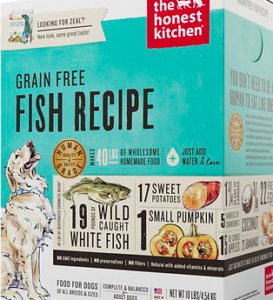 The Honest Kitchen Dog Food company seems like a top-notch source for food for my pets. Your drill-down article laid it out nicely as to why this is the case. That the owner is someone that recognized that there was a gap in what was being offered in the market starting way back in 2002 has led to the current success they are experiencing. That is in large part due to the owner I think, as she saw her dog in need, so developed the recipes with ingredients that helped the dog get healthy. That is a great start for a business, no doubt. I see that they have expanded their line by a huge amount over the years, and quality still counts when it comes to our pets. My pets are part of my family so we treat them as good as any member of the family. The food they eat is important to me, I want to know they are getting proper nutrition with the food. I have seen cases where dogs are sick, stressed, or worse because owners do not feed them properly. Especially knowing that they offer human-grade dog food is a huge plus for me. Not that I want to eat it regularly, but there is comfort in knowing that their food is that good! The variety they offer is also more than enough to keep my pets happy, I am sure. You have completely sold me on this brand and their line of dog food. The Honest Kitchen Dog Food will be in my home as fast as I can order it and see it delivered! 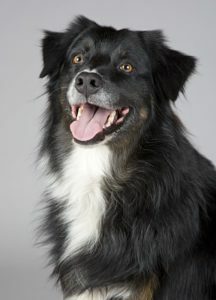 Thanks for the work putting this together, I and my dogs are really happy to have found your website and this article! Thanks Dave, for stopping by to read this article. I couldn’t agree with your comments more. 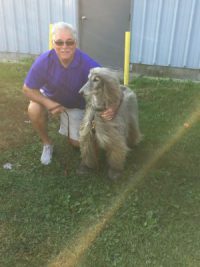 The fact that the owner, watching her dog with health issues, and deciding to do something about it herself impacted me as well. Not only did she take matters into her own hands, she also found the compassion to share her recipes with other dog owners. Sure, it made her quite wealthy, but you can’t ignore the number of dog owners who benefited from these recipes. Happy to hear your pets are considered family, I feel the same way towards mine. Please let me know your experience with the Honest Dog Food, I would love to know how your experience with this food goes. Hope this article has brought you some insight into this company as well as the recipes they offer. Please let me know how your dog responds to the Dehydrated Turkey recipe. Would love to hear your feedback. Hello there, happy to hear you found this article interesting. Like you, I believe the Honest Kitchen recipes are indeed a healthy and nutritious meal for your pets. Let me know if you decide to try one of the Honest Kitchen products. Feel free to leave additional feedback. Thank you, I hope to get to some of the questions you brought up in the very near future. Please come back soon to check out the details. Your article is really awesome .Your article will be much more helpful for dog owners.Your article is about the dog’s dehydrate meal.Your article has a recipe for making a dog’s dehydrate meal. It will be very helpful for dog lovers and dog owners .So,Thank you very much for sharing your article. Thank you for taking the time to read this article. I certainly hope you are correct, and dog owners everywhere can find some benefit from this article. Thanks again. This a really beautiful idea from the founder of the Honest Kitchen. If we human beings do better healthwise with free range birds and naturally sourced vegetables and fruits without chemicals and all, how then do we think our pets wouldn’t also do better healthwise with these kinds of food. Now, pooch owners can be assured that their dog food is being prepared with the best nutritious products and made with utmost care. Making it human grade provides even more assurance that it is safe for the dogs and even more beneficial. I remember when my babies were young, I would taste any food I would give to them because I believed that if I couldn’t eat it,then there was no need to give it to them. What a great thought! Taste your dog’s meal before placing it in front of them. You read and hear so much these days about a specific product that can change your life. Maybe, maybe not, but one thing for sure is the money these companies are putting in their pockets. I simply have a different vibe when I read about the founder of Honest Kitchen. I believe this lady, although doinf quite well financially, truly cares about the health of our pets. She and her company realizes the importance of healthy ingredients and have produced products that are good enough for human consumption. Hard to argue with that! I have chosen for my dog “Dehydrated Grain-Free Beef Recipe” because It wholesome meal for puppies and adult . Human grade recipe. 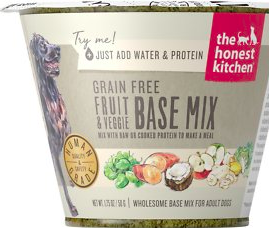 Next I have chosen Dehydrated Grain-Free Fruit & Veggie Base Mix honest kitchen dog food. Contains an antioxidant-rich of fruits and veggies in It. Thank you so much for sharing a important information. So happy to hear that you have chosen these products, I think you and your pet will be happy with the purchase. Would love to know your feelings on both products. Thanks again, for taking the time to read this article. I certainly hope the Honest Kitchen recipes are a huge success for you. I love my Yorkie so very much. He’s getting up there in age now, turning 12 this year. But he’s always been a very finicky eater. It took a long time to finally find food he’d actually eat on its own when he’s hungry enough. I’ve many different types of food with no luck. Now, I give him dry Cesar kibble and add fresh chicken to it every time. He’s happy with that. It took so long to finally find something he’s happy with, I hesitate to change it now. However, I will be ordering the Proper Topper Meal Booster and see how that goes. Hi Annette, thanks for reading my article. Some dogs just are finicky when it comes to food, and I am happy you found something that your Yorkie seems to enjoy. i think it is smart on your part to add fresh chicken to his diet, as it is a great source of protein. Please let me know how the Proper Topper works out for you. I look forward to your feedback. I have greatly benefited by reading your important and informative article about Dog Food. I was looking for something like the Honest Kitchen recipes for my pet dog. I appreciate you for the realization that a pet is part of the family. I think Grain-Free Chicken & Cranberry Cookie Treats will be suitable for my poodle. What do you recommend? Hope I can find the price from Amazon. Thank you sincerely for the useful review with some nice videos. Hello Ranao, glad you found my article. Yes, the treats you are asking about would be a nutritious and healthy one. I have no problem in recommending the Grain-Free Chicken & Cranberry Cookie as I prefer the grain-free for my own dog. You can find these treats on the Amazon or Chewy sites. Hope this helps, and thanks again for visiting my site. Hello Ash, happy to hear that you are a dog lover as well! The negative reviews (not many) from Amazon and Chewy had to do with taste. A few customers simply stated that their dog(s) did not like the taste. This may be attributed to the transition from one food to a new one. I really appreciate the detail you have put into this article, from the beginning, till now of this company. I am very impressed with the ingredient list, of each of their different varieties of food, and the fact that is is all dehydrated not processed. You are right, about being part of the family, our pet Casey, I don’t think he knows, he is a dog. I refer to him as our Fur Baby. Every evening he has his food, then has supper with us. We have tried to find what we thought was the best for him. But, from your article, and viewing your site, I realize we need to find another alternative. This article has made me think seriously about a change in what we are feeding him. I have your site in my favorites so I can go over it with my husband. What is your personal favorite dog food at the moment? I will follow up to see you opinion of the Honest Kitchen dog food that you decided to try and your review. Hi Rose, thanks for visiting my article. Like you, I was not all that familiar with The Honest Kitchen Company which played a big role in learning more it. The more research I did, it became quite clear to me that the company’s beliefs are similar to my own. I think way too often, dog owners do not due due diligence or research when it comes to selecting the appropriate dog food. Pet owners should, and need to pay close attention to the ingredients within the bag they pull off the shelf at their local pet store. Sounds like Casey has a great home! That truly warms my heart when I hear stories like this one. I will be ordering one of these Honest Kitchen recipes in a the next day or two and will be happy to provide you with some feedback in the very near future. I have a 12 year old Afghan Hound at home and will be transitioning to this new food very shortly. Best of luck to you and Casey and please let me know if you decide to give the Honest Kitchen a try. Thanks Rose. Thank you Luke, For your reply. I am seriously considering this food, thanks to your article. Also, I will be keeping tabs on your site for an update, on how your Afghan Hound likes the new food. Thanks Rose, I will certainly let you know how my pooch responds to the new food. To read that these lady Lucy and her co-founder were inspired by their own dog which suffers skin and ear issues to setup Honest kitchen to produce dog foodsfoods shows that one can derive inspiration from our daily lpives and make life better for ourselves by setting up firm. Although I don’t like dogs but the inspiration I derive from this content is to go ahead and setup a firm that will solve problem. Thanks for the content. Thank you sir, I wish you the best in your endeavors! Thank you for reading the article and I am glad to hear that it may have inspired you. Best of luck!